Germany had elections on September 27 to choose its next government. The current head of the government, Chancellor Angela Merkel, is expected to continue to be the Chancellor of Germany. Germany has elections approximately every four years to choose the next government, and Merkel has been the Chancellor since 2005. A famous magazine, Forbes, has named Merkel the most powerful woman in the world for each of the last four years! Germany is Europe’s largest economy, and the world’s fourth largest economy (after USA, Japan, and China). After World War II, the country was divided into four zones, occupied by USA, UK, France, and the Soviet Union. These four zones became two countries - the zone occupied by the Soviet Union became German Democratic Republic (East Germany), and the remaining zones became Federal Republic of Germany (West Germany). Even Berlin, the capital city, was split between the two new nations. East and West Germany became one nation again in 1990, 41 years after their separation. 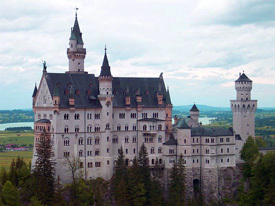 Germany is famous for its castles, cars, cuckoo clocks, composers, fairy tales, black forest cake, and much more! It’s given the world some of the most famous automobile brands - BMW, Mercedes Benz, Audi, and Volkswagen. Famous composers – Johann Sebastian Bach, Ludwig van Beethoven, and Johannes Brahms were all born in Germany. Albert Einstein, one of the world’s greatest scientists, was also born in Germany. You’ve probably heard of Snow White, Sleeping Beauty, Rapunzel, Cinderella, and Hansel and Gretel. The Brothers Grimm wrote all these fairy tales, after hearing stories from different people. Seen the Sleeping Beauty castle in the middle of Disneyland Park in the United States? This is heavily influenced by the Neuschwanstein Castle in Germany. One of Germany’s most famous landmarks is the Brandenburg Gate in Berlin. 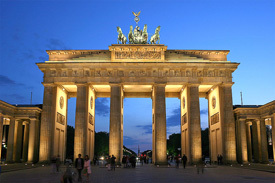 It was built in 1791 as one of the gates to enter the city of Berlin and was a symbol of peace. Oktoberfest, one of the world’s largest fairs, is currently going on in Munich, Germany. Over 6 million people from around the globe will come to enjoy Oktoberfest. It was started almost 200 years ago by a Prince as a celebration for his wedding. The fair lasts 16 days, and starts in (surprise!) September.